Perhaps some of the specialists here could help me to date the bicycle. I own a Rudge Whitworth bicycle. I bought it from a college professor. He said he bought it mail order around 1949 and paid approx. $150.00 . I would like to know if it is worth anything. I'm cleaning up a old Peugeot for a friend who is going to start riding again. He purchased the bike new around 1978. It has not been ridden in 10 years or more. We are trying to figure out what model it is. Besides the Peugeot decal there is a small decal that says CADRE ALLEGE. The frame is 25 and 1/2in tall from the center of the crank to the top of the seat tube. Its a 10 speed. 27 X 1 1/4 tires. The front forks are chrome plated at the lower end. The lugs are kind of fancy and highlighted with gold pinstriping. The brakes are center pull Weinman 610 and also say Vainqueur 999. Simplex shifters and derailers. It has a cotterd crank with 3 spokes that bolt to a Nervar set of chainwheels. The hubs are alloy high flange Normandy hubs. Can anyone tell me what model this bike is and how desirable it is? English bikes are my passion, so I don't know much about French bikes. Just the fact that it is about a '78 and has steel? cottered cranks indicates its a low to mid-range model and not worth a lot of money. That said, its still a good bike by vintage stds and if it cleans-up presentably, can be ridden with pride if the size fits. crank set with no trouble. Get a couple alloy rims on there, too, if you really want to ride smooth and light. Rigida and Araya (Japanese) are readily available...or go with Wolber "super champion" if you want a stronger wheel. I concur with the other respondents. Yes, it is almost definitely a UO-8, yes, it is worth improving with aluminum rims and cranks, and yes, Sheldon's website is a recommended read. As discussion area regulars know, one of my commuters is a Peugeot UO-8 with aluminum rims and cranks and SunTour gears, including ratchet barcons. Thanks for the info. The chrome and paint cleaned up nicely. The bike will be getting some new tires tomorrow. I think it will also be getting a new seat too. I hope I can get my friend back into riding again. I just checked for fender eyelets and the front forks have double eyelets the rear has a single set of eyelets. I guess that makes it a UE-8. fyi, I believe "cadre allege" translates to "frame guaranteed"
Thanks, Ken. You've helped to reduce my ignorance of bikes in a good part of my collection. The "Tube Special Allege" is another one popping up on the bikeboom models. The term seems to have vanished with the inception of the stickers; "Carbolite 103" around the early '80's. I have wondered if there is any difference worth noting in the actual tubing. Most of my "Carbolites" are of the internal-lugged versions, although one is lugged, I seem to recall. Dual eyelets in front and single in back is consistent with the UO-8. I have owned two UO-8s and one internally lugged Carbolite 103 Peugeot (UO-9? UO-10?). The latter felt PERHAPS a bit deader and heavier than the former, but this is a highly subjective call. Wow! I can't believe that I found this string. I just acquired this same bike free of charge. Saw it covered in dust in the back corner of the basement of my building. My landlord said it was left years ago and he was about to toss it. The bike is exactly as described by Jeff R but for a few things. This frame is painted yellow, the front fork is entirely chromed, and the front and rear derailluers are Campy Gran Sport. I assume that the Campy gear was added later. The serial number (stamped on the left chain stay) is Y710 28094. With these differences, should I still consider this a U08 or could it be a different model? I am confused by the serial number. One website indicated that due to the placement of the serial number and the "Y" prefix that this is a 1987 vintage. That doesn't seem right. HELLO. I HAVE A BLUE PEUGEOT THAT HAS BEEN IN OUR FAMILY FOR MANY YEARS. MY OLDEST BROTHER BOUGHT IT USED AROUND 1970. I'D LOVE TO KNOW MORE ABOUT IT. CAN ANYONE HELP WITH HOW I START TO ID THE BIKE? ANY HELP WOULD BE GREAT. 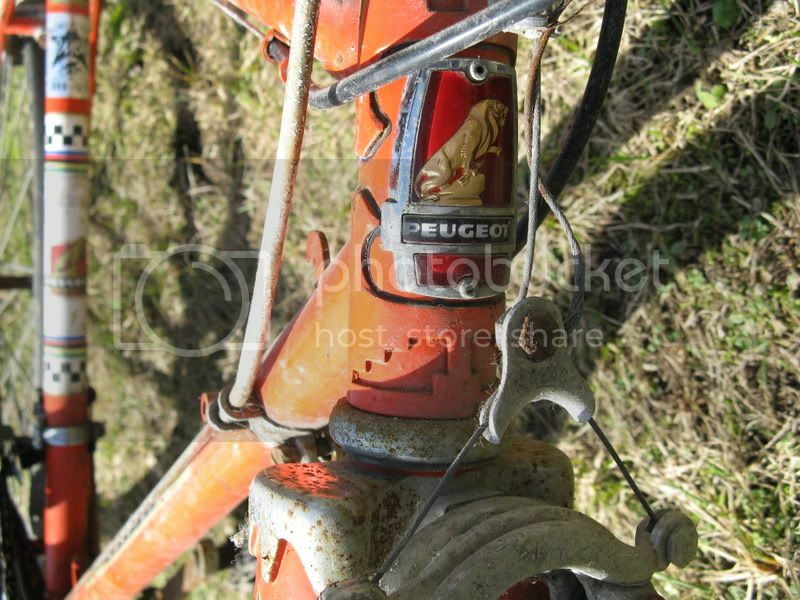 I am trying to decide whether to restore an old Peugeot 12-speed bicycle or simply sell it. It's pretty loose in the Bottom bracket and stamped there RY K4... no luck with finding a serial #. I live in Ontario, but its got "North Star Cycle - Vancouver" label on the vertical seat tube. It's an orange colour with black&gold striped Peugeot logo on Downtube. I thought its a PA-10, but its got 12 speeds and the SunTour Gear shifters are on Headset. ...anybody any ideas? My sister inherited a U09 for college, but she rides a 52cm and this is a 57cm, hence I am selling it for her. Men's 23 inch (57cm) silver Peugeot U09. Bike is in good condition, but requires (1) new front tire, (2) new seat cover, and (3) new bar tape. Bike would benefit for a "light" tune-up, very minor truing of wheels, and wash. Plus a light scrub with an abrasive pad to lift the very little surface rust. There are no dents or dings and the bike is absolutely straight. Please let me know what you think the fair market value of this bike is. I originally thought to list at $135, but then found at least three to four others online for $250 in USA and Canada. I have a Cadre Allege I need to sell. How much should I sell it for? first question is how many balls go on either side of the front and rear hub? how tight do i make the cones against the balls? any info or links will be greatly appreciated! I recently picked a bike up from a local thrift store and was woundering about any information on this bike,maker,year ect. I picked it up for $5.50 and it rides well but would really like to know more about it. Here is the description. The decals read BROWNING MADE IN BELGIUM and there is a picture of a black birds head(possibly a hawk) and directly under that a spoked wheel. the bike is a metalic flake gold brown and components are as follows. It sounds to me like an early-to-mid 1970s basic bike boom 10-speed. 1) Which type of Nervar crank -- cottered steel, cotterless steel, or cotterless aluminum "Star"? The Star a very decent crankset with cranks resembling Stronglights and rings resembling early Campags, was used on mid-level European bikes of the period. 2) Are there any "tubing pedigree" stickers, e.g. Reynolds 531, on the frame? 3) 5-speed (I assume) or 6-speed freewheel? I had a low end Browning wih Simplex drivetrain. Apparently they had 3 models during the bike boom. Yours could be the midgrade with the Suntour gears. Not likely a high end frame...does it have proper cast/forged dropouts with integrated hanger. If so, it's a better frame.The V GT Luxe is a very good derailleur. Could be a great ride. I am trying to find the year this bicycle was made. My father bought it in the early 1930's in Winnipeg. The front sprocket and wheels have been changed. It had wooden rims and a rear carrier. Couldn't see the pic...send it to me if you don't mind. Look for a serial number around the seat tube lug under the saddle. I was wondering if anyone here might know where I could find Olmo transfers or decals for about a early 1980's Olmo frame, I am wanting to refinish the frame but shure would look good if I could find something close to what it had on it. I check with cyclart and sounds like they won't sell decals unless they repaint your frame for you as most others I am thinking will tell me the same thing, if anyone knows where I might find some would be appreaciated thanks.